Dallying In The Dirt, Issue #179 --- 300 plus came for the great tour.. I know this is Monday, not Friday. Friday was spent in the mad scramble to finish as much as we could for the great garden tour. Saturday, over 300 people wandered through and admired the garden. 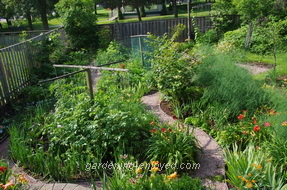 It was a joy to have so many people tell us what a delightful garden we had. Answering questions, often the same question, can be very tiring but interacting with all of the interested gardeners was actually a great deal of fun. Sunday we slept and here we are doing a truncated version of “Dallying” on Monday morning. 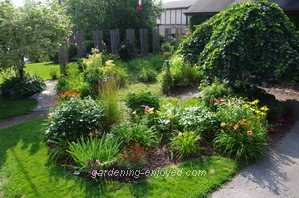 All three pictures are overviews of the garden looking its absolute best. It was a very pleasant stroll this morning with the camera and a ladder. Got a few strange looks while climbing the ladder in the middle of the driveway with no apparent purpose. The first picture is the front yard with its dominating Camperdown Elm, one of the most frequently asked question. The Assistant Gardener was greeting visitors there while I stayed in the back. 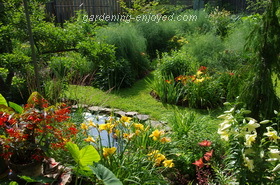 This second picture is the centre of the back yard looking over the ponds, towards the beds with the Asparagus. Its identity and where did the actual edible Asparagus appear, was the dominant question in that area. The third picture is the East side of the back yard where the majority of vegetables are grown. Lots of questions about the various devices and techniques that allowed us to grow so many things vertically and thus produce a significant amount of food from a relatively small space. We plan to be back with our regular Friday “Dallying” at the end of this week to tell you what is being done and needs to be done in the garden as the summer progresses. Lots of Zucchini to eat now and the Peppers are starting to produce. The Daylilies are blooming regularly and look great with Asparagus fern as a background. The pest elimination score: Chipmunks 7, Squirrels 2, Rabbits 0; I will find the right enticement soon.